Boy, I remember a few years ago when I decided to plant according to the moon phases, as outlined in my Farmer's Almanac. I didn't get a bumper crop or anything, and as far as I know the food I did get did not contain more vital energy. The chief benefit was it broke the planting season into manageable chunks. Maybe my modern life, disconnected from the Earth and the growing things upon it, has rendered me incapable of seeing lunar magic. Too bad. I dreamed the other night that we were weeding and found a clump of bindweed with a root ball the size of a cabbage, and in the dream I looked at it in despair, and said, "Well, I guess we can try cooking it." Bindweed is the bane of my existence. Well, one of the banes of my existence. I have a bunch of banes. What is it? I am very sicked out and curious. 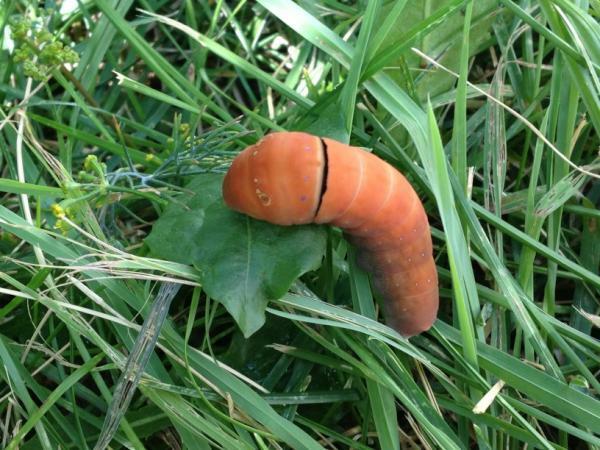 I described it to a plant pest lady at USU, and she thinks it's probably a kind of swallowtail. That doesn't help much, since there are like a million billion kinds of swallowtails. But I think she's right, because it does have little forked horns that come out when it's mad, and I think only swallowtails have those. (Osmeterium, they are called.) If only I knew what it eats, and we could keep it in captivity and find out what kind of butterfly it makes. Utah pale swallowtail fifth instar caterpillars change color from green to brown before pupating.